We do a lot of Mexican food reviews on this site. So many that I’m kinda getting tired of Mexican food. I ate at the Latigo Kid over a week a go, but just didn’t really feel like writing it up, mostly because we’ve had better reviews that needed to be posted. Still, it’s only fair that I give this place their shot at EatMeCalifornia infamy. Plus it’s great material for a lazy Sunday evening. The Latigo Kid – Next to the Canyon Club, Kanan exit off the 101 freeway. So, I had never been to this place before. But I had always seen tons of people coming out if it before making their way next door to party at Canyon Club. For those of you who don’t know, Canyon Club is the best place to catch all of your favorite 80s bands that have no business still touring, yet continue to do so anyway. They also have a great 80s coverband called the Spazmatics, that performs every Thursday night. If you go on a Thursday, you’re guaranteed to have a good time. But this isn’t a review of the Canyon Club, so I’ll leave it at that. The Latigo Kid is a decent sized place, despite the fact that it looks tiny from the parking lot. The decor is your standard Mexican restaurant fare, except the fact that they have some cool murals painted on the walls. The vibe is pretty low-key and not as raucous as Los Toros in Chatsworth. I arrived with a group of friends and the host sat us in a large booth in the bar area. Chips and salsa were on the table before you could blink and they gave you both hot and mild salsas for your dipping pleasure. For what it’s worth, the chips and salsa were probably the highlight of the meal for me. Sad, I know, but true. I would say that the hot salsa is the way to go as it packs a good punch but still has a lot of flavor. Our waiter came back to take our orders and drop off our drinks. The service was incredibly fast. Almost, too fast. I felt like they were trying to get us out of the restaurant as quickly as possible and it wasn’t a good feeling. I ordered the Enchiladas de Vallarta, which are made with crab. I also chose the albondigas soup over the salad. The albondigas soup was pretty average. The broth was filling and delicious, but the veggies were a little too mushy and instead of giving you one big meatball, they gave you 3-4 mini ones. The mini meatballs were pretty dry considering they’d been simmering in soup and I wasn’t a huge fan. 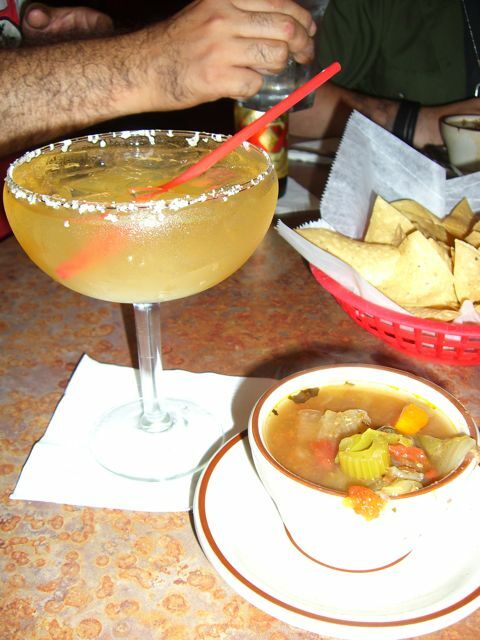 On the other hand, the Cadillac margarita that I had with it did a lot to make up for the mediocre soup. Before I could finish my soup, my enchiladas were on the table. They were coated in so much cheese that it overwhelmed the dish. The portion was pretty big though, which is good considering it’s fairly expensive for a Mexican restaurant. Overall, this was a very hard dish to judge. I was unimpressed with the refried beans and found the rice to be just plain awful. The crab enchiladas were both good and bad. They were made with huge chunks of jumbo lump crab, which I liked, but the crab tasted a bit too fishy for me. It was probably a little on the old side because I doubt many people order that dish. Still, that fishy taste is never a pleasant experience. The avocado was a little under-ripe, and like I said before, they used way too much cheese. I kinda felt like they thought all that cheese would serve to hide all of the flaws in the dish. Sadly, they were mistaken. My friends all had the chicken enchiladas and were happy. I guess I just got the shaft for ordering the exotic dish, which tends to happen to me a lot. Still, I can’t lie about the food I did get. I was disappointed with both the meal and the fact that the servers seemed to want to get us out of there so they could get off work. The chips and salsa were great, the portions were huge and the drinks were strong. But that’s where the positives end. Maybe someday I’ll go back and give them another shot, but with the amount of good Mexican food that we have nearby I don’t think it’ll be happening anytime soon. That place is close to my old Agoura hood and I always meant to try it. Maybe its good that I never did, lol. When we went we actually went on an off night so no one had much to do but be as on the ball as possible. I’ve waited half an hour to sit down on a friday night but the chips are always there and it takes a little longer to get to you meal. The best thing to eat at Latigo Kid, in my opinion is the following. 1 or 2 cheese enchilada combo, with rice and beans. They have the BEST refried beans at Latigo, sometimes I get a serving of just beans. They remind me of my childhood, when my good friends mom would make her famous refried beans and eggs for breakfast. I really love their albondigas soup as well. By far their margarita on the rocks is the best margarita ive ever had. Its the only mixed drink that does not cause my face to break out in hot red welts. We’ve been going here for over 10 years. 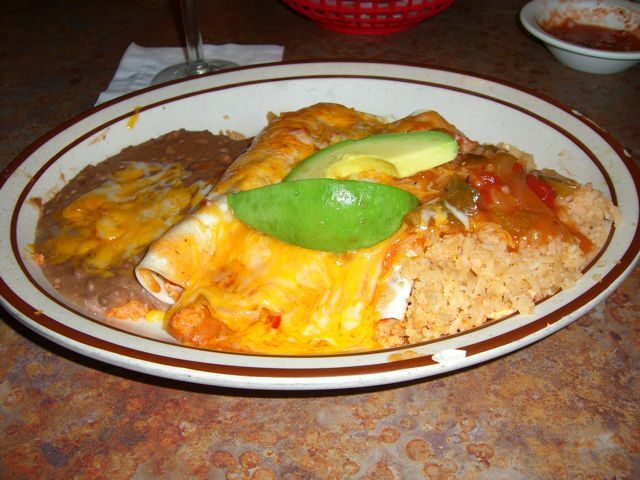 Cheese enchiladas is the reason we go there, and that is what everyone gets! Even the kids love them.